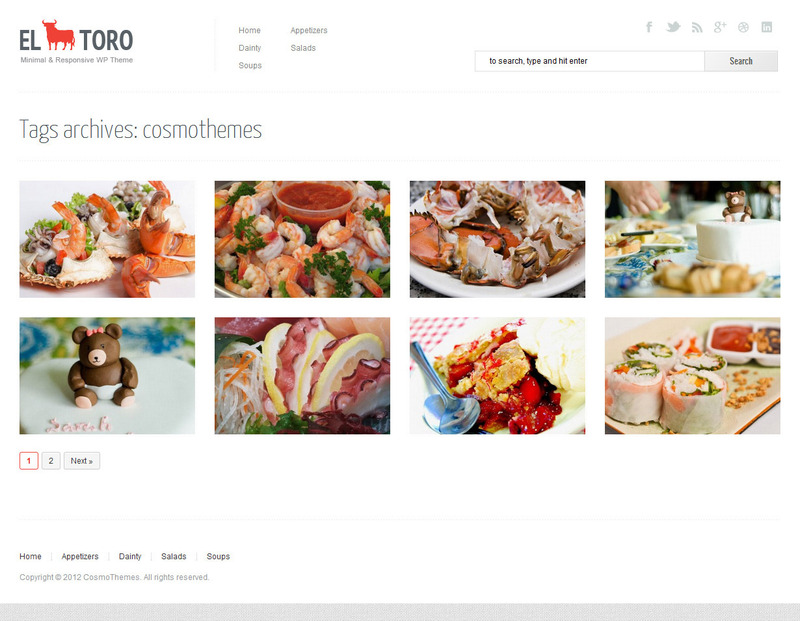 El Toro is a minimal and responsive portfolio WordPress theme build to power both individual sites and multiple users’ community with content sharing. 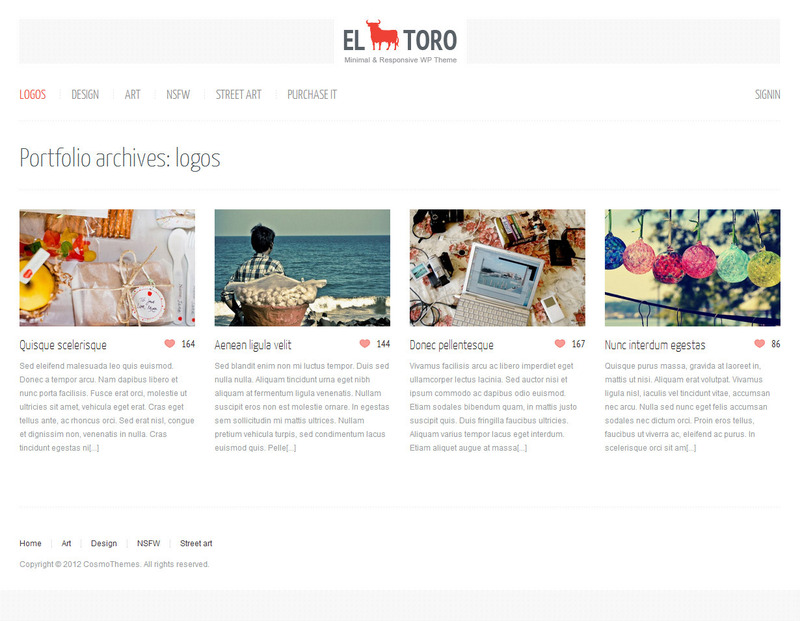 El Toro is a responsive theme. It uses a framework that permits the site to be accessed on all mobile devices, including iPad and Android powered tablets. Set your blog mainpage to display any content type you wish: post from categories, tags, portfolios, latest or featured post, even individual posts. You can choose how to display your content for each added element: carousel, filter, load more button or pagination. 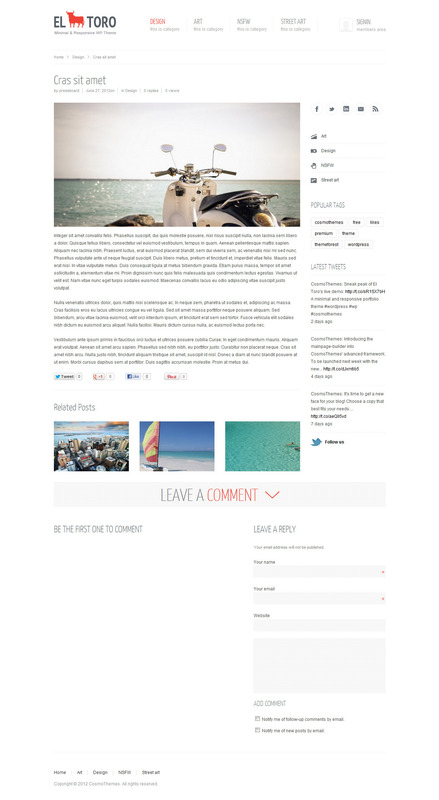 You can also choose your layout: full width or with sidebar and enable the grid, thumbnail or list-view. left-side logo aligned with menu and user login link. left-side logo with vertical menu and social media icons. There are also several menu styles: simple text, with description, colored with option to choose background and text color, etc. You can use the narrow or large port-view layout by simply ticking the corresponding setting from backend. Also, you can set different colors for your body. 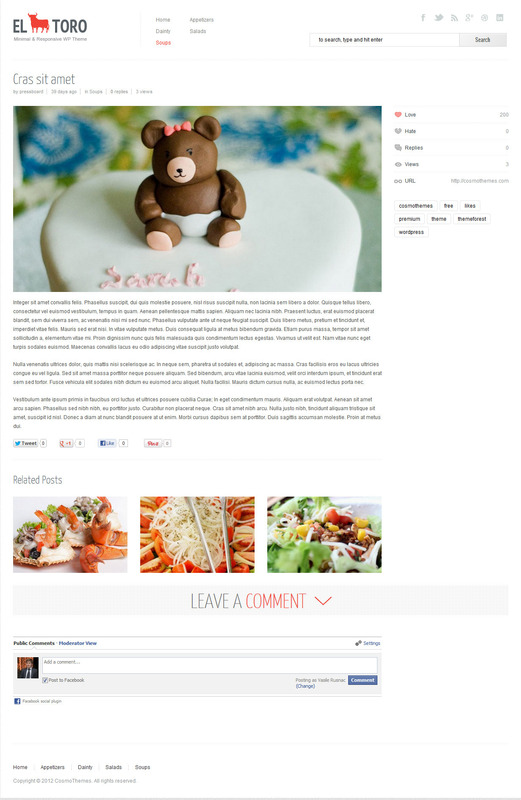 Not the least, you can add background images for individual posts or for the whole site. 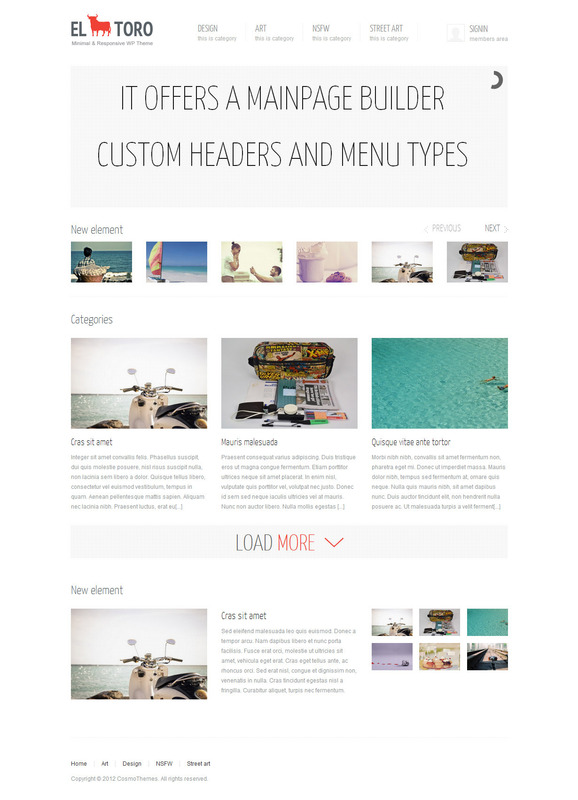 The theme comes with several predefined background patterns, as well. 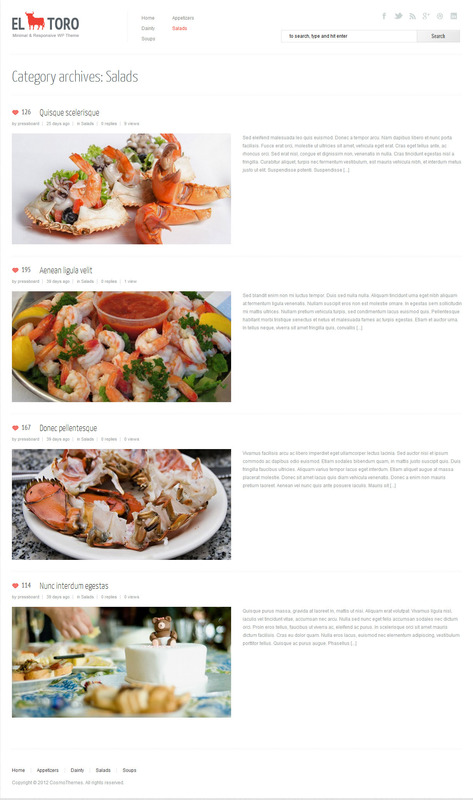 Finally, you can have multiple category layouts: grid view, thumbnails view or list view. Enable the “Love” feature to let users easily access faved posts and raise their rating. When a certain post reaches the limit of 50 likes it will become hot. The like limit can be changed from backend while the number of likes for all posts can be randomly generated. El Toro comes with a revised powerful back-end to let you control all sites option without the need to hack or customize your own features. 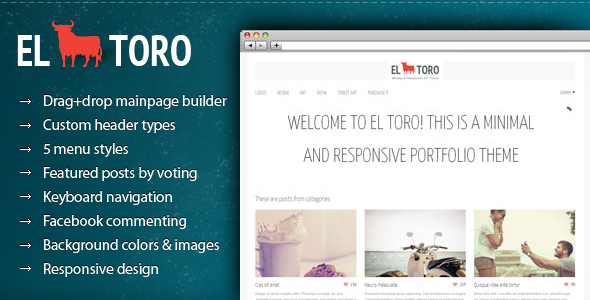 El Toro comes with a .PO file that allows you to translate the theme into your language. Follow the instructions from documentation.